There is no doubt that technology has taken over lives in the blink of an eye. The complexity of the aerospace industry has witnessed tremendous escalation over the past few years. For the aerospace industry, where strenuous and intense projects demand an on-time delivery, several companies find it difficult to maintain their pace while providing mission and safety critical systems, and also accomplishing cost and time-to-market goals. Technology has brought an infinite change in the landscape of the functioning of businesses in the aerospace arena. The constantly modifying aerospace field requires acute dedication and understanding for the entire workforce to shift from traditional to modern systems. From digitizing workflows to finding contemporary means of testing machines and maintenance of aircraft parts, aerospace consulting firms and solution providers have solved issues by incorporating a great deal of scientific knowledge into their structures. The aerospace industry has boosted its confidence to make an impact on customers and scrape out aged methodologies. Hence, most aerospace solution providers are redesigning their work channels by incorporating latest technological trends like monitoring and providing data in seconds through cloud integration. As government and commercial airline businesses grow and expand, their requirement for enhanced back-end operations also dramatically increases and some companies have excelled in delivering the best technology services. In the last few months, we have looked at hundreds of aerospace providers and shortlisted the ones that are at the forefront of tackling the challenges of the aerospace industry. We also evaluated the service providers’ capabilities related to the deployment of PLM Software, Air Traffic Management, Visual Interactive Analytics, Secure Satellite Communication, 3D Simulation, etc in the specific context of aerospace business. We have looked through vendors having the capability to fulfill the needs of government and commercial airline companies by integrating latest technology that supports core business processes of this industry. 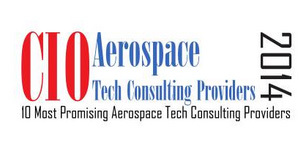 In this edition, we present to you CIO Review’s Most Promising Aerospace Technology Solution and Consulting Providers of 2014. 4Sight Technologies Offers advanced integrated scheduling solutions that manage aircraft maintenance scheduling systems. Aloft Aviation Consulting Provides associates to help in minimizing risk and managing safety. Avicor Provides knowledge of the aircraft to the buyers according to the needs and requirements. CAMO Delivers multivariate data analytics for organizations to get deeper insights and make better predictions from their data. Gladstone Aerospace Provides business services to companies bridging the gap between potential and capability. Innodata Provider of content solutions, data analytics and related services to publishers, information providers, and enterprises. Pacific Aerospace Consulting A specialized independent services company constituted to provide worldwide support capabilities. Peregrine Consulting Offers consulting services to OEM aircraft and turbine manufacturers. Synesis7 Holistic enterprise data transformation, software, and system solutions provider. Toffler Associates Serves as a catalyst for change, creating successful futures for clients through uncommon knowledge.